From left to right: SANDAG chair, Hon. Ron Roberts, with associate vice chancellor Garry MacPherson and commute solutions manager Curt Lutz. 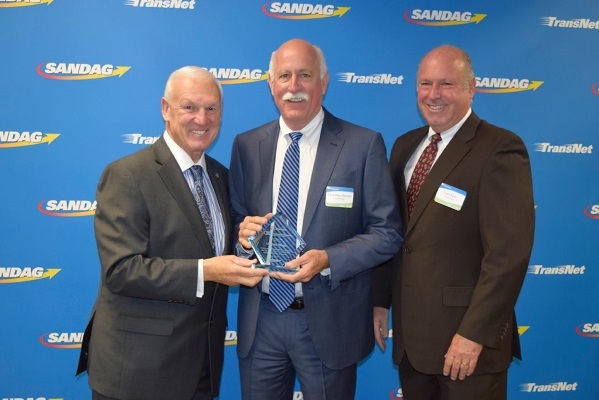 The University of California San Diego has received a Diamond Award from the San Diego Association of Governments (SANDAG) in recognition of the campus’ efforts to encourage workers to use environmentally sustainable transportation. Fifty-seven percent of UC San Diego commuters use transportation other than single-occupant vehicles, reducing annual transportation-related CO2 emissions by approximately 55,000 metric tons. Alternative transportation methods include public transit, campus shuttles, carpool, vanpool, Coaster Club, Pedal Club, carsharing, Zimride, ride-matching access, cycling and more. UC San Diego is one of only 13 employers to be awarded a Diamond Award in the Platinum Tier, the highest level of commuter sustainability. The campus has received 14 Diamond Awards in the past 16 years. The Diamond Awards are presented by the SANDAG iCommute program, which provides a variety of services to commuters and employers to help reduce traffic congestion and greenhouse gas emissions. The Diamond Awards program recognizes employers as they meet milestones in the development of their commuter benefits programs. The program is based on a points system tied to employer engagement, annual event participation and shifts in employee transportation choices.